Sometimes certain malware infections can make it next to impossible to remove by locking infected files. With Advanced File Remover, you can easily unlock files so that they may be removed. Since Advanced File Remover is a portable program, it can be run from virtually any location, whether it be stored on a USB memory stick or your desktop. It requires no installation. 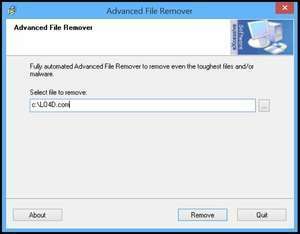 For security reasons, you should also check out the Advanced File Remover download at LO4D.com which includes virus and malware tests. Additional screenshots of this application download may be available, too.